IT HAS been known that rising carbon dioxide concentrations in oceans—better known as ocean acidification—can cause changes in the behaviour of fish. However, the reason for it was not understood well. Now scientists at James Cook University in Australia have found how acidifying seawater perturbs the brain functioning in fish. 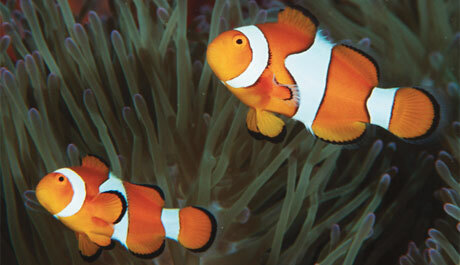 For the study, published online on January 15 in Nature Climate Change, the team analysed the brain chemistry of clownfish. The research idea emerged after scientists from the university in their earlier experiments found that laboratory fish were exhibiting behavioural quirks in high carbon dioxide environment. The fish found it harder to locate a reef or detect the warning smell of predator fish (see ‘Nemo finds its predator’, Down To Earth, August 1-15, 2010) The team then speculated that a connection between nerves and chemistry might be involved. It is known that once excited, nerve cells need a chemical to calm them. GABA-A receptors present in cell membranes do so by controlling the exchange of ions like carbonate and chloride between the cell and the environment. Highly active GABA-A receptors selectively allow the entry of chloride in the cell which numbs the fish’s response. The researchers tested their hypothesis by using GABA-A inhibitors. They bathed clownfish in a chemical that deactivates the GABA gateway. These fish were able to smell the predator’s scent and protect themselves. So are all fish species equally vulnerable to ocean acidification? “All fishes are at risk. But the ones most vulnerable are those with high metabolic rates. They need to expose their gill surface more to the water to get oxygen. Thus in turn will be exposed more to carbon as well,” says Philip L Munday, professor of marine biology at the university. He adds that fish like tuna that inhabit a stable environment with stable carbon levels are also at risk as they lack the ability to adapt to changing pH.